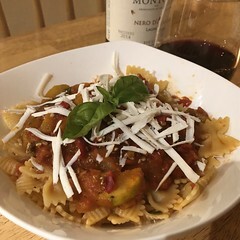 This recipe is a tribute to my cousin Annmarie, it’s roughly based on the classic Sicilian dish Pasta alla Norma but uses cucuzza instead of eggplant. Cucuzza is a ‘common’ vegetable from Sicily and a favorite with Italian-Americans of Sicilian and Calabrian origins. It has also become a symbol of our humble Italian heritage, This was one of the reasons I have created this to honor my cousin Annmarie. Annmarie was one of the strongest women that I have ever known and a great influence (the women in our family are extremely strong willed). I miss her greatly as does anyone who knew her. 1. Toss the sliced cucuzza with olive oil and grill on the BBQ or in oven, set aside. 2. Sauté the onions, garlic and optional Peperoncino in about 2-3 tbsp olive oil. 3. When the onions show signs of transparency and the garlic softens add a cup of white wine. 4. When it comes to a simmer add the the hand crushed fresh plum tomatoes or canned tomatoes along with the bay leaves. 5. As the sauce begins to simmer add the tomato paste and a cup of water. 6. Let simmer for about 5-10 minutes, taste and season with salt and pepper. 7. As the sauce simmers add the cooked cucuzza. 8. After about 5 minutes of simmering, add the fresh basil and the lemon juice. 9. Add the grated Pecorino Romano cheese, mix well and let simmer. 10. Taste and add salt and pepper, if needed. Serve with Ricotta Salata sprinkled on top.